Hang 10 little dudes and dudettes! D6 Sports is very excited to launch the new SurfSkimmer which is a revolutionary skimboard designed for beginners and little kids. My children are ages 5, 6 and 8 and love spending fun filled days at our beautiful Florida beaches. They have enjoyed splashing in the surf as they gaze longingly at the surfers and skimboarders. 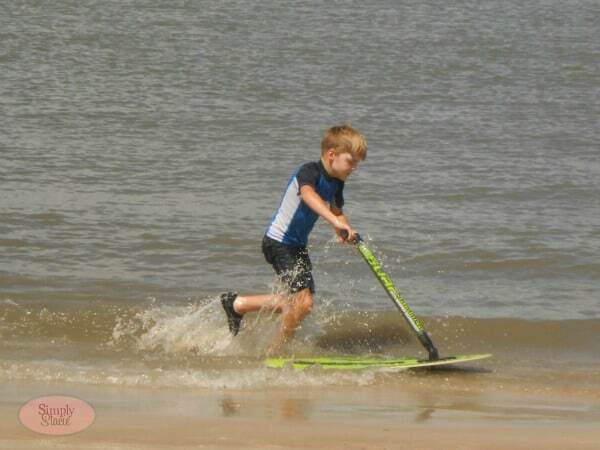 Now, they can start learning how to skimboard by using the SurfSkimmer! What makes this a great entry level skimboarding experience for the child is that it has a stable handle, gripper technology and a sleek design so the board glides over the white wash water. 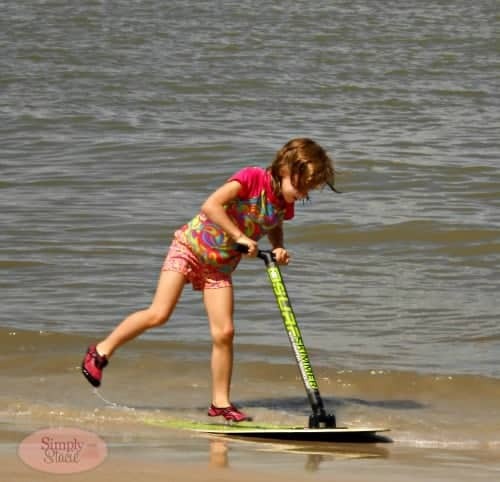 My kids had so much fun practicing their new skills and they seemed to get better and better as they enjoyed using their SurfSkimmer during our day at New Smyrna Beach. Lots of other beach goers came over to check out their board and they beamed with pride when they got a big “thumbs up” from the surfers. When they did their first 360 degree turn they were so excited and got lots of applause from their family and new friends. As a Mom, I love that I can actually open my eyes and watch them practice without being overly fearful as this is a much safer way to learn how to skimboard as opposed to past attempts on other brand boards. When they become more experienced, I can even remove the handle from their skimboard so they can use it in the more traditional manner and practice more advanced skills so this is a board that is sure to get lots of use. The SurfSkimmer supports up to 150 pounds and is available in two colors, blue and green. My kids and I are very impressed with the design and durability of this innovative product and look forward to many more fun-filled beach days with their SurfSkimmer. You are invited to visit D6 to learn more and purchase your SurfSkimmer for only $69.95 with free shipping! Connect with D6 SurfSkimmer on Facebook and Twitter. I wish that I had a toy like this when I was younger. That is so cool!! 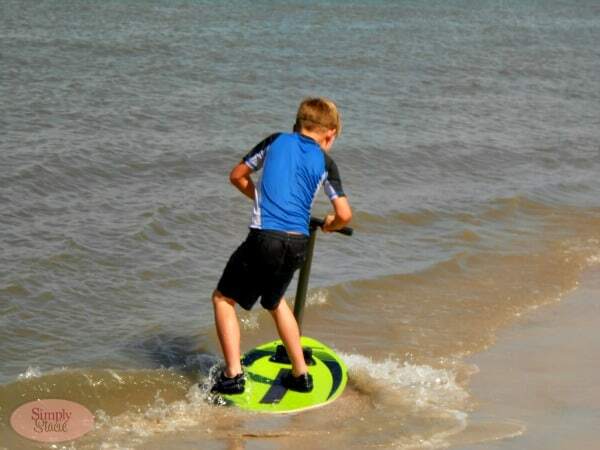 I wish we had beaches around here, as my son would love this toy, and it is much safer than a regular skim board. Awesome!! I love this! It would be perfect for my daughter who is not a daredevil but wants to try. She has tried in the past but it was not great and she doesn’t like getting tossed around to much. It is great that you can remove the handle. That looks like sooo much fun! What a neat product! My nephew would have a blast with that. I HAVE to have one of these, and not for the kids! I’d love to be able to skim across the water and not fall off. This is a must for kids! My niece lives near the ocean and would love this. This is something new and different for at the beach. The kids should have a lot of fun with this. I like that it has a nice handle on it to , makes it easier for the kids to hang on to it. I like this so much I wish that it was adult-sized! My kids would really enjoy using this! Thanks for the review! 20% off and free shipping now till the end of July! The handlebars are a great idea…. I ate sand hard once on one of those “skimboards”. This looks a lot safer. WOw I would’ve loved this as a kid. My kids love the beach, I may have to consider getting one for them to keep them out of the house longer lol! How great that it develops with you. Love that the handle is stable but removable for learning and building on your skills. I know my grandson would have fun on this. A new toy to add to the beach fun. This looks like so much fun! I would love to get one for my grandson for his birthday in August!